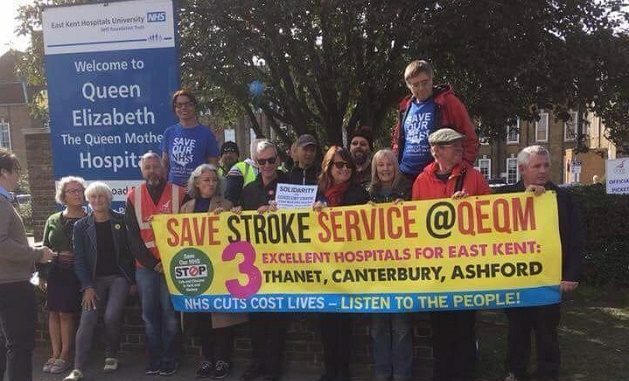 SAVE Our NHS in Kent campaigners are calling for people to protest outside the QEQM Hospital in Margate next Saturday (October 6) in protest at plans to close the stroke service and move it to Ashford. 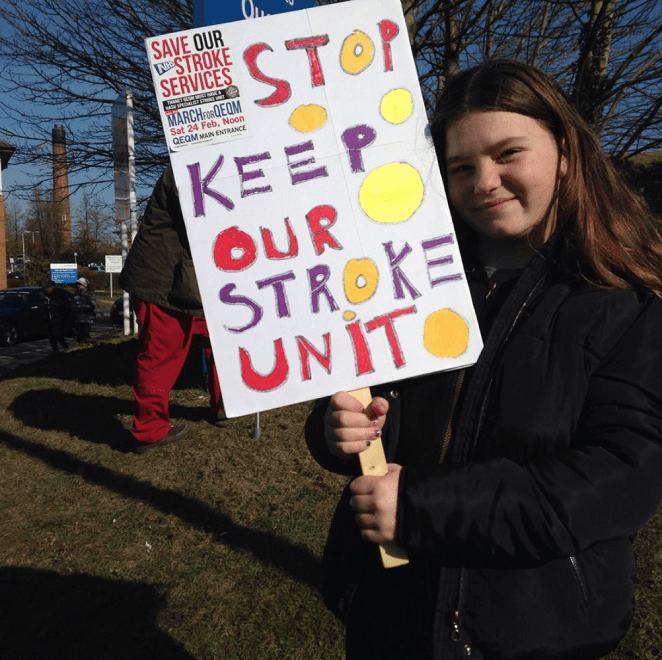 The demo is in protest against a decision by local NHS bosses to opt for three hyper-acute stroke units in Kent — with the nearest one to Thanet being at William Harvey Hospital in Ashford. The NHS in Kent and Medway – which includes all 8 Clinical Commissioning Groups – Bexley in south east London and the High Weald area of East Sussex drew up a shortlist of five options and has announced Darent Valley Hospital, Maidstone Hospital and William Harvey Hospital as preferred options for the specialist units. The decision means current services will likely be removed from some hospitals, including QEQM in Margate. The NHS says hyper acute stroke units will reduce deaths as each will have a multi-disciplinary team of specialist stroke clinicians, seven days a week caring for patients in the critical first 72 hours. SONIK says there may still be hope to save the stroke unit in Margate. Join the Save Our NHS in Kent rally outside the QEQM Hospital on Saturday, October 6 at noon at the Ramsgate Road hospital entrance. As the sole Labour County Councillor who sits on the Kent wide Health Overview and Scrutiny Committee, where these decisions are made and ratified, I will continue to draw attention to the health needs of Thanet residents. The health inequalities for Thanet need to be taken fully into account. I believe this decision is wrong and should be subject to a Judicial Reveiw. If this closure goes ahead i certainly won’t vote for my MP who will not oppose it. Sadly i can’t vote labour until Corbyn and momentum are long gone! I’m afraid that by taking that chance your stroke service, and I fear A&E will have gone. Whatever you feel about Corbyn et al – the tory plan is to sell your NHS. I believe the Kent wide Health Overview and Scrutiny Committee (HOSC) have the ability to refer plans back to the health secretary in the early stages, something that unfortunately didn’t happen with the Stroke Plan. Hopefully the HOSC won’t miss the opportunity this time, and will take action over the upcoming A&E plans and be able to push back on it before it’s too late. This article says “there are currently no specialist hyper acute units”, which is something the NHS managers frequently say. 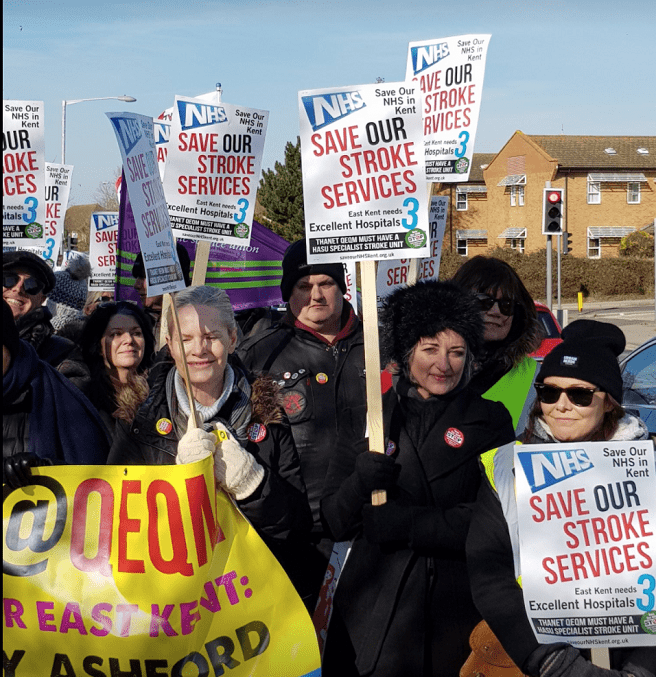 It could leave some people with the impression that the current stroke unit at QEQM has no specialist working there, which is not the case. It is an acute stroke unit with specialist stroke consultants, stroke nurses and therapists. The unit is going to be closed, and the staff are currently being presented with documents explaining their options (take up a role 40 miles away in Ashford, or try to find a generalist role at QEQM, possibly on a lower wage, with wage protection for a short period only). It is true that there are no ‘hyper’ acute units here; they have been rolled out to about 6 or 7 location in the UK so far. None have yet shown a significant uplift in death and disability outcomes – in fact only one has shown an uplift at all (london, where the upper limit journey time is 30 mins). Some features of the Hyper Acute Stroke Units (HASUs) are a very good idea (measures to link ambulance communication directly to the stroke ward; improving time taken to diagnosis), but these positive measured have been married to the centralisation of stroke units into fewer locations, ie cutting the number of units. This means longer journey times which have not been proven to be safe, and will offset (at best) any benefits that may come from the positive measures applied. The improvements have been tacked on the cuts to make them more palatable; the effect of these improvements has been overstated; and no benefit to centralisation has been seen in a recent study into A&E closures. Another study shows that ‘distance decay’, is something that happens when moving care further away from where people live – health declines in those areas less well served with access to healthcare.